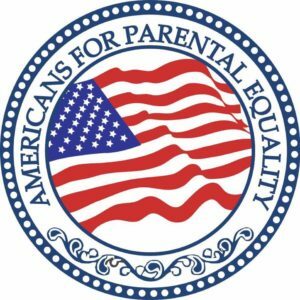 We advocate for equal parenting and a presumption of 50/50 with divorcing parents or parents in a custody dispute, assuming both are fit and loving. Request: Please support legislation that mandates a rebuttable presumption that children of all ages have the inalienable right to have equal possession time with both fit parents. Problem: The current Texas Family Code is outdated and does not reflect the norms of our society. For many decades, the current system has encouraged conflict between parents when it comes to custody of children. In almost all cases, where the parents do not agree on a possession and access schedule, the judge will use their discretion to determine which parent has the right to designate the primary residence of the child AND the right to receive child support based on the “best interest of the child.” To sway the judge to rule in their favor, each parent embarks on a long and expensive court battle, slinging mud and highlighting the bad characteristics of the opposing party, all to obtain custody of the children. These custody disputes end up costing tens of thousands of dollars and effectively turn the children into pawns to control and alienate the other parent, which is child abuse. The divorce attorneys are the only winners under this system. Background: In Texas, the rebuttable presumption is the Standard Possession Order (SPO) for children under 3 years of age. 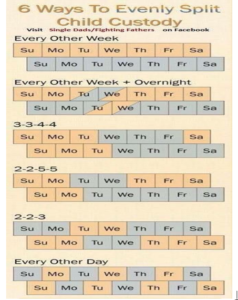 This allows the “losing” parent to have 2 hours every Thursday and 48 hours every 1st, 3rd, and 5th weekends (only 2 months/year have 5th weekends), a total of 104 hours per month during the school year. YES, a whopping 4 days and 8 hours! On average using 30 days per month, that means that the children only see their other parent 14.44% of the month. This is far from enough time for the children to form a healthy bond with the non-custodial parent. For children over 3 years of age, the rebuttable presumption is the Expanded Standard Possession order. This allows the children to be with the “losing” parent every Thursday night and Sunday night when it falls on the 1st, 3rd, and 5th weekends. When calculating possession time on a nightly basis, this schedule allows the children 10 overnights per month with the “losing” parent (roughly 33% of overnights) during the school year. Facts of Standard Possession Order: The charts below summarize the number of nights the children spend with each parent when the Standard Possession Order is utilized in Texas family courts. Clearly, the imbalance in parenting time can be seen on an annual basis at roughly 74% Custodial and 26% Non-Custodial. This imbalance is harmful to the children in the long-run because they are not able to form the healthy bond that they desperately need and desire. The non-custodial parent has no hope of being effectively involved in parenting a child with such a lopsided schedule. Facts of Expanded Standard Possession Order: The charts below summarize the number of nights the children spend with each parent when the Expanded Standard Possession Order is utilized in Texas family courts. On an annual basis, the children will be with the custodial parent 57% of overnights and the non-custodial 43% of overnights. This is better than the SPO, however there is still an egregious imbalance between the custodial and non-custodial parenting times and rights. For example, the non-custodial parent cannot take their own child out of school for a doctor or dentist appointment, or even to lunch on the child’s birthday, because their possession begins only when school is dismissed. a. The current system deprives children and the non-custodial parent of proper due process. b. Child Protective Services understands and practices proper due process because they know the State may not deprive, impinge, remove, or otherwise harm or interfere with any natural parent’s superior and preclusive constitutional rights to the custody of their direct blood offspring without first alleging and then proving, with clear and convincing evidence, that one or both parents is seriously unfit. c. In today’s family court system, a judge, with the broad discretion of “the best interest of the child” (which cannot be consistently defined), can limit and or terminate a parent’s right to their child without first alleging, and then proving serious parental unfitness, with clear and convincing evidence. d. With 50/50 equal parenting, a child’s right to have equal access to both fit parents will not be impinged unless one or both parents is found seriously unfit, with clear and convincing evidence and with proper due process of law. a. The current system deprives most fathers of Equal Protection. b. In today’s family court system, there is clear gender discrimination. Statistics show that 85% of the time, the mothers are awarded custody and deemed the custodial parent. It is not because the fathers don’t want to share their kids equally, it is because there is a true bias in the family court system throughout the State. c. With 50/50 equal parenting, each parent will have equal protection of the laws. 3. The Equal Protection Clause of the 14th Amendment also states that there shall not be unequal classes of citizens. a. The current system creates two separate classes of parents. b. In today’s family court system, oftentimes there are two separate classes of parents: a custodial parent and a non-custodial parent. The custodial parent has more rights (right to determine residence, right to receive child support, right to take the child off school campus for lunch or doctor appointment, right to spend more time with the child, etc.) than the non-custodial Parent. c. With 50/50 equal parenting, neither parent will be a second-class parent. 4. Both the 5th Amendment and 14th Amendment state “nor be deprived of life, liberty, or property, without due process of law. a. The current system deprives the non-custodial parent of property, without due process of law. b. In today’s family court system, when creating a custodial parent without proper due process, there is also typically a child support order that forces the non-custodial parent to pay the custodial parent a monthly amount or go to jail. This money is the property of the non-custodial parent. c. With 50/50 equal parenting, neither parent will be deprived of their property. Lie #1: It is harmful for the child to have equal time with two parents who are in conflict with each other. Truth: This conflict does not warrant restricting the child’s equal time and equal rights to care, custody, control, and companionship of the parent. 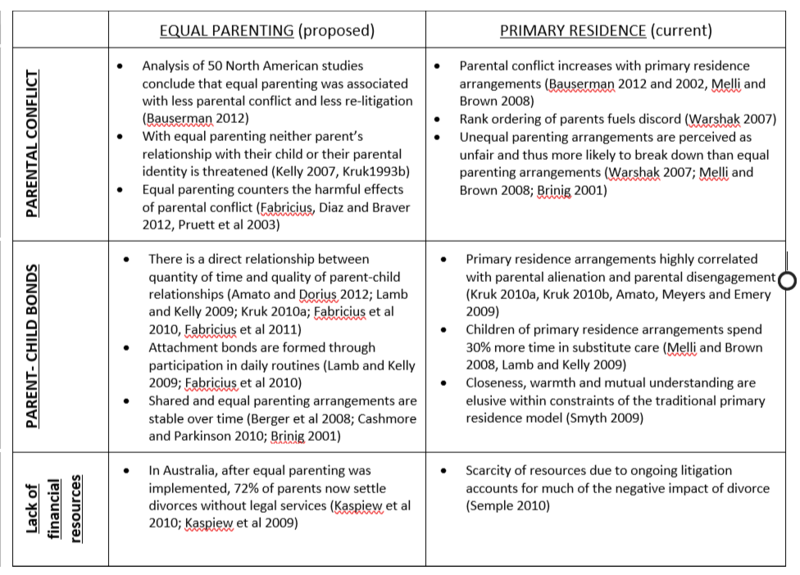 In fact, there is no scientific data to support that unequal parenting time benefits the child. Experts in the field have shown that equal parenting time is a huge benefit to children. There are many facts that support the idea of equal parenting plans being beneficial to the overall well-being and happiness of children. These studies also show more overnights also increases the overall parental commitment to children in a split family, resulting in healthier and committed relationships with both parents (4). Truth: Hundreds of researchers agree the current Best Interests of Children Standard (BICS) should never have been applied to fit parents, only to abused or neglected children (4,5). The experts on the topic of BICS agree that it is an indefinite standard that actually increases the likelihood of conflict, participation in strategic bargaining by parents, broad character assassinations, and prolonged litigation. In fact, there is no objective or scientifically valid rules to determine best interests of children, when dealing with fit parents. This results in judges implementing their own bias (good, bad, or criminal) under the guise of the child’s best interests with no data or documentation of reasoning to back up their rulings. Lie #3: Expanded Standard Possession is 47/53 and almost 50/50 so why bother changing the laws? Truth: Expanded Standard Possession is nowhere near 50/50. It sits right around 40/60, depending on the year and the school district the child resides (as illustrated on page 2). Lie #4: The Family Law Foundation will tell you that the 2-hour Thursday possession from 6 pm to 8 pm is a full day and that Friday from 6 pm to Sunday at 6 pm is 3 full days. Truth: There are exactly 22 hours difference between 2 hours and a full day. And last time we checked, 48 hours was still 2 days, not 3 days. The Family Law Foundation is misleading and intentionally fraudulent! Lie #5: The kids can’t handle all of the back and forth with 50/50. They need a stable home. Truth: There are many ways to split child custody evenly, as illustrated below. However, with the current system, both SPO and Expanded SPO, the children are exchanged more times than the proposed Equal Parenting models of every other week, every other week + overnight, 3-3-4-4, and 2-2-5-5. See the chart below. Click to view the document that will be distributed at the Texas GOP Convention June 14 – 16, 2018.